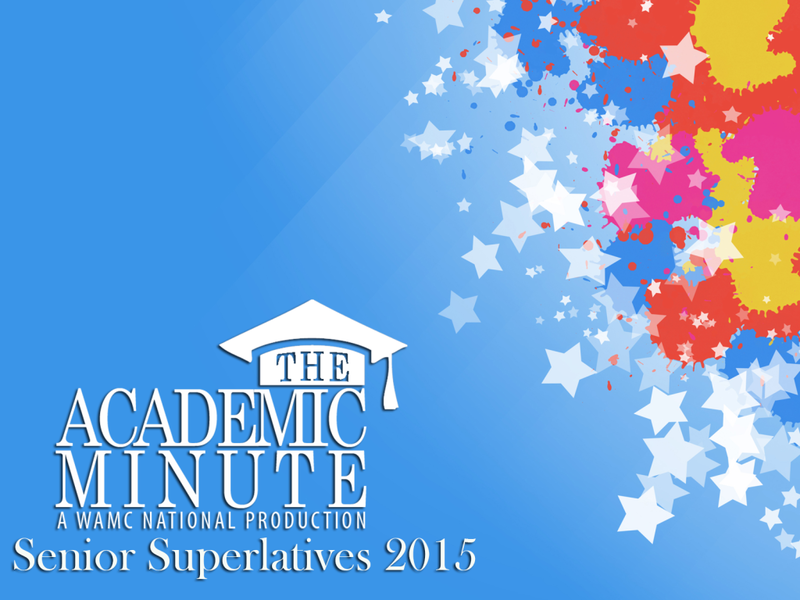 To honor the hard work of the contributors and public relations teams at the higher learning institutions, The Academic Minute team is proud to announce the Fifth Annual Senior Superlative awards. Dr. Martin Krieger has become a fan favorite on The Academic Minute. He contributed four very interesting segments in the 2014-2015 period and continues to amaze us with his very involved and intricate views of cities. Dr. Paul Arciero, a professor in Skidmore College’s health and exercises department, won the Most Likely To Change The World Senior Superlative Award for an invigorating analysis of the proper way to exercise, which will be helpful for all of us as we attempt to lose all those holiday pounds! Dr. Ron Mallett, a research professor of physics, takes home the Most Likely To Blow Your Mind Senior Superlative Award for his theories on time travel. Dr. Megan Ferry, associate professor of Chinese at Union College, won The Meta Senior Superlative Award for her profile of foreign language studies. Dr. Larry Stevens wins the Most Likely To Take Over The World Senior Superlative Award for his segment on the brain enhancing capabilities of chocolate. Could there be anything better? Over 11,000 miles separate Albany, NY and Perth, Australia. As a result, Dr. Nicole Mitchell’s examination of the assisted colonization of an endangered species wins our World Traveler Senior Superlative Award. The Academic Minute team is happy to honor Jeff with the Best Press Senior Superlative award. Jeff keeps us very up to date on all the interesting research and happenings at the University of Missouri and is very helpful is procuring the professors to appear on the show. Thanks Jeff! As public relations manager in the Andrew Young School of Policy Studies at Georgia State University, Jennifer has exemplified school spirit throughout her relationship with The Academic Minute. Her friendly e-mails are always a welcome addition to our inboxes, and the research from her university has elevated The Academic Minute to new heights. Congratulations to her on winning the Most School Spirit Senior Superlative Award. Because this segment garnered the most internet traffic, Dr. Hatschek wins our Social Butterfly award, as his segment on jazz and civil rights was music to the ears of our listeners and followers. Dr. Mitch Grayson, Associate Professor of Pediatrics, Medicine, Microbiology and Molecular Genetics takes home our President’s Choice Senior Superlative Award. Dr. Pasquerella selected this outstanding segment on treating the common affliction of asthma. The people have spoken and in a landslide victory they’ve selected Dr. Tye Williams’ segment as the Listener’s Choice Senior Superlative Award. Dr. Tye-Williams’ segment detailing workplace bullies struck a chord with our listeners, who voted over 600 times for this research.